The science is clear: It is understood that we are facing an unprecedented global emergency. We are in a life or death situation of our own making. We must act now. The world must act swiftly and robustly to keep global warming under 1.5°C and try to avoid utterly catastrophic impacts to life on Earth. Human activity is causing irreparable harm to the life on this world. A mass extinction event, only the sixth in roughly 540 million years, is underway. Many current life forms could be annihilated or at least committed to extinction by the end of this century. The air we breathe, the water we drink, the earth we plant in, the food we eat, and the beauty and diversity of nature that nourishes our psychological well-being, all are being corrupted and compromised by the political and economic systems that promote and support our modern, consumer-focussed lifestyles. We must act while we still can. What we are seeing now is nothing compared to what could come. 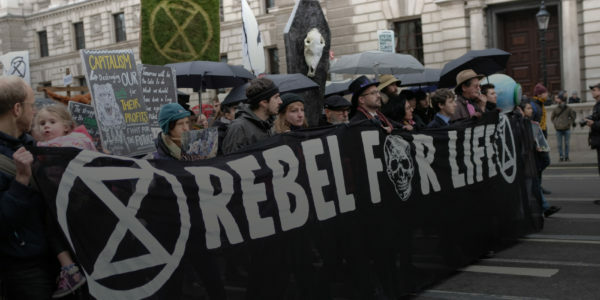 Effects on global human society, if the climate and ecological emergency is not addressed, may spiral out of control. But our leaders are failing in their duty to act on our behalf. Our current systems of governance is compromised by a focus on profits and economic growth. Politicians can be influenced by lobbies of powerful corporations and the media are hampered by vested interest of corporate advertisers undermining our democratic values. We have run out of the luxury of time to react incrementally..
We must radically and immediately begin reducing emissions and improving carbon absorption, drawing it down and locking it up again. The task before us is daunting but big changes have happened before. Let’s make a better world. In 1992, the Union of Concerned Scientists including the majority of living science Nobel laureates, penned the “World Scientists’ Warning to Humanity” calling on humankind to curtail environmental destruction and warning that “a great change in our stewardship of the Earth and the life on it is required, if vast human misery is to be avoided.” They showed that humans were on a collision course with the natural world. They proclaimed that fundamental changes were urgently needed to avoid the consequences our present course would bring. The authors of the 1992 declaration feared that humanity was pushing Earth’s ecosystems beyond their capacities to support the web of life. They described how we are fast approaching many of the limits of what the biosphere can tolerate without substantial and irreversible harm. They implored that we cut greenhouse gas (GHG) emissions and phase out fossil fuels, reduce deforestation, and reverse the trend of collapsing biodiversity. Our house is on fire. Over 50% of the human addition of carbon to the atmosphere through the burning of fossil fuels has occurred in the last 25 years – i.e. since the IPCC was founded. Human activities have caused the planet’s average surface temperature to rise about 1.1°C since the late 19th century. Most of the warming occurred in the past 35 years. As the global temperatures rises we see an increase in extreme weather events such as heatwaves and droughts. For example, scientists from the UK Met Office who examined the extreme heat wave which struck Europe in the summer of 2003 (which is now know to have killed 70,00 people,) concluded that “it is very likely…that human influence has at least doubled the risk of a heatwave exceeding this threshold magnitude.” If we carry on burning fossil fuels, such an extreme heatwave will become an average summer for Europe by 2040 and almost all summers will be hotter than that by 2060! As shown in this graph…. A “biological annihilation” of wildlife in recent decades means the Sixth Mass Extinction in Earth’s history is under way. Looking at the UK for example, the 2016 State of Nature report found that they were “among the most nature-depleted countries in the world”. One in five British mammals are at risk of being lost from the countryside with the populations of hedgehogs and water voles declining by almost 70% in just the past 20 years. Whilst another new report by the British Trust for Ornithology found that more than a quarter of British bird species are threatened, including the Puffin, the Nightingale and Curlew. Across Europe the abundance of farmland birds has fallen by 55% in the just the past three decades! Globally species are going extinct at rates up to 1,000 times the background rates typical of Earth’s past. The direct causes of biodiversity loss being habitat change, overexploitation, the introduction of invasive alien species, nutrient loading and climate change. The average rate of vertebrate species loss over the last century is up to 100 times higher than the background rate. The total number of vertebrate species that went extinct in the last century would have taken about 800 to 10,000 years to disappear if the background rate had prevailed. The latest Living Planet Index shows an average decline of 60% in population sizes of thousands of vertebrate species around the world between 1970 and 2014. More than a quarter of the assessed species (around 100,000) are threatened with extinction. That is 40% of all amphibians, 25% of all mammals, 34% of all conifers, 14% of all birds, 33% of reef-building corals, 31% of sharks and rays. Corals reefs are suffering mass die-offs from heat stress. These events are becoming much more common with back to back die-offs on the Great Barrier Reef in Australia in 2016 and 2017. The predictions are that at even at 2C of warming these heat waves will occur on an annual basis. “20 years from now, every summer will be too hot for corals: they will disappear as dominant members of tropical reef systems by 2040-2050. It’s hard to argue it any other way.” – Prof. Ove Hoegh-Guldberg directs the Global Change Institute at the University of Queensland. Catastrophic reductions in global insect populations have profound consequences for ecological food chains and human crop pollination. There is strong evidence that many insect populations are under serious threat and are declining in many places across the globe. Multiple pressures might include habitat loss, agro-chemical pollutants, invasive species and climate change. A 27-year long population monitoring study in Germany revealed a dramatic 76% decline in flying insect biomass. Decline in flying insect biomass. One of the world’s leading medical journals, The Lancet, carried out a major review which concluded that climate changed posed “the biggest global health threat of the 21st century” because of both the direct impacts of extreme weather events and the indirect disruption to the social and ecological systems that sustain us. More frequent and severe water extremes, including droughts and floods, impact agricultural production, while rising temperatures translate into increased water demand in agriculture sectors. Risk of extreme weather hitting several major food producing regions of the world at the same time could triple by 2040 (1 in 100 year event to 1 in 30). Water withdrawals grew at almost twice the rate of population increase in the twentieth century. The global water cycle is intensifying due to climate change, with wetter regions generally becoming wetter and drier regions becoming even drier. A 2018 UN report highlights that at present, an estimated 3.6 billion people (nearly half the global population) live in areas that are potentially water-scarce at least one month per year, and this population could increase to some 4.8–5.7 billion by 2050. Rising temperatures will melt at least one-third of the Himalayas’ glaciers by the end of the century even if we limit the temperature rise to 1.5°C. Melting glaciers in both the Andes and the Himalayas threatens the water supplies of hundreds of millions people living downstream. A severe drought in Cape Town in 2018 led to severe water restrictions being put in place. The city came to within just days of turning off its water supply – dubbed ‘Day Zero’. Climate scientists have now calculated that climate change has already made a drought this severity go from a one in 300 year event to being a one in a hundred year event. At 2°C of warming a drought of this severity will happen roughly once every 33 years. 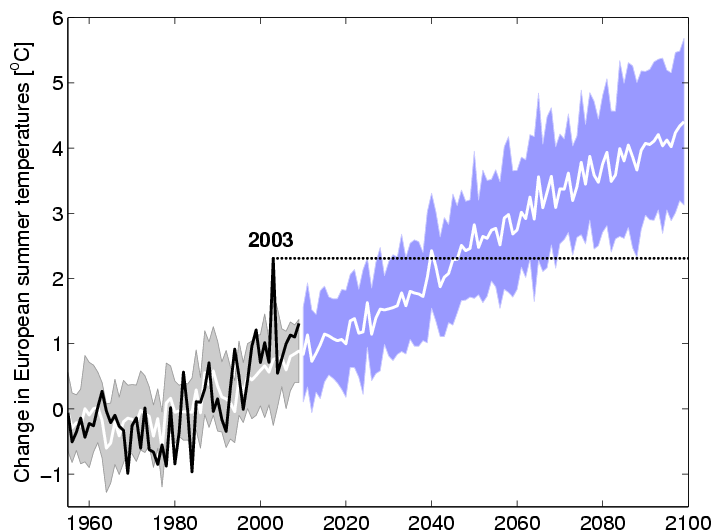 Sea level is rising faster in recent decades. Sea level rise is caused primarily by two factors related to global warming: the added water from melting ice sheets and glaciers and the expansion of seawater as it warms. Sea level rises will cause inundation of low lying land, islands and coastal cities globally. As sea level rises higher over the next 15 to 30 years, tidal flooding is expected to occur much more often, causing severe disruption to coastal communities, and even rendering some areas unusable — all within the time frame of a typical home mortgage. 2°C warming would threaten to inundate areas now occupied by 130 million people while increase to 4°C could lock in enough eventual sea level rise to submerge land currently home to 470 to 760 million people globally. The land ice sheets in both Antarctica and Greenland have been losing mass since 2002. Both ice sheets have seen an acceleration of ice mass loss since 2009. Antarctica is losing six times more ice mass annually now than 40 years ago. In 2014 a team from NASA found that part of the West Antarctic ice sheet had already begun what they described as an “unstoppable” collapse, locking in at least a meter of sea level rise. If we continue warming we will trigger the collapse of more sectors of the ice-sheets. Present ocean acidification is occurring approximately ten times faster than anything experienced during the last 300 million years, jeopardising the ability of ocean systems to adapt. Arctic sea ice is now declining at a rate of 12.8 percent per decade. Summer Arctic sea ice is predicted to disappear almost completely by the middle of this century. Scientists are now investigating connections between the huge changes we have seen in the Arctic and changes to the jet stream resulting in increasingly dramatic impacts on extreme weather events at lower latitudes. Nitrate from agriculture is now the most common chemical contaminant in the world’s groundwater aquifers. These pollutants can also dramatically affect aquatic ecosystems, for example, through eutrophication caused by the accumulation of nutrients in lakes and coastal waters impacts biodiversity and fisheries. Ocean dead zones with zero oxygen have quadrupled in size since 1950, suffocating the organisms that live in those areas. More than 95% of what we eat comes from soil. It takes about 500 years to form 2.5 cm of top soil under normal agricultural condition. Soil erosion and degradation has been increased dramatically by the human activities of deforestation for agriculture, overgrazing and use of agrochemicals. By 2050, land degradation and climate change together are predicted to reduce crop yields by an average of 10 per cent globally and up to 50 per cent in certain regions. Earthworms cannot compensate for the loss of top soil as they too are being depleted by 80% or more from intensive agrichemical fields. Several species of worms are extinct and many others are likely heading that way.